In one of the most anticipated moves in the international cannabis space, Colombia is set to begin exporting cannabis to Canada. The country is poised to become one of the largest producers and exporters of marijuana in the world on the basis of the export quota assigned by the International Narcotics Control Board last year. As per the INCB, Colombia is authorized to grow 40.5 tonnes per year, or roughly 44 percent of the world’s legal marijuana. The first Colombian company to receive approval — from both Health Canada and the Colombian National Narcotics Fund — to export cannabis to Canada is Ecomedics S.A.S., doing business as Clever Leaves. Exports will start in mid-February, the company said. Benzinga had the chance to discuss the move with Andres Fajardo, CEO of Clever Leaves. 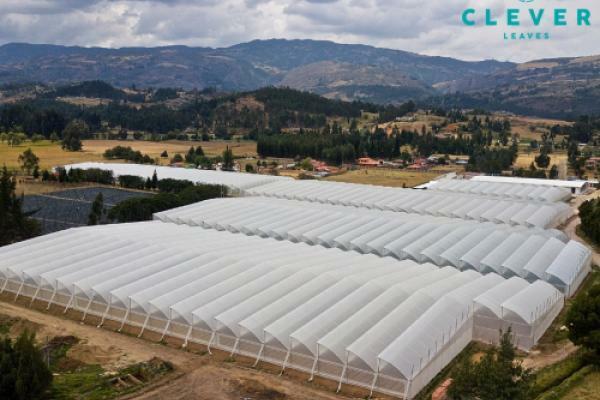 “This shipment, the first legal [one] of its kind, is a testament of Clever Leaves’ efforts to build its operations at scale and with global quality standards, innovation throughout the value chain and strong commitment to the patient in Colombia and the world,” he said. Northern Swan Holdings, a financial sponsor of Clever Leaves, helped secure the import permit with Health Canada. Northern Swan CEO Kyle Detwiler said the arrangement is two years in the making. For Detwiler, credibility is of utmost importance. Consequently, he said the first round of exports will be used for testing the raw material only and will not be used for commercial purposes. “We will eventually test our extracted product to show to governments globally that our pharmaceutical standards in Colombia are equal, if not better, than most operations in Canada or the United States,” the CEO said. “I cannot think of one cannabis company in the United States which has built its assets to be pharmaceutical-grade." The aim now is to prevent recreational dispensaries from running out of stock, and this represents an opportunity in markets such as Germany that many American cannabis companies are unaware of, Detwiler said. In the CEO's view, the "invisible hand" of the free market will eventually prevail — meaning that cannabis will one day largely be grown it the areas where it can grow naturally. “This is a reminder that it does not make sense to build $100 million-plus cannabis growing facilities in Canada or even the U.S.,” he said. Other publicly traded cannabis companies with investments in Colombia include Khiron Life Sciences Corp (OTC: KHRNF), Pharmacielo Ltd (CVE: PCLO), Aphria Inc (NYSE: APHA), Wayland Group Corp (OTC: MRRCF), Chemesis International Inc (OTC: CADMF), Cronos Group Inc (NASDAQ: CRON), Canopy Growth Corp (NYSE: CGC) and Aurora Cannabis Inc (NYSE: ACB). All stand to benefit from the commencement of cannabis exports to Canada. Photo courtesy of Clever Leaves.